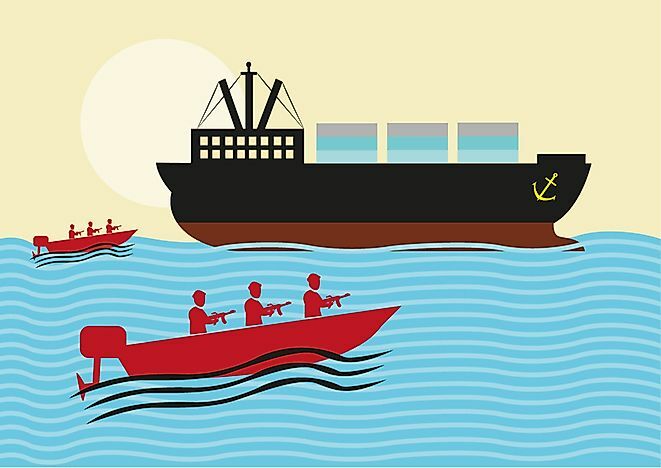 Piracy off the coast of Somalia has been plaguing the international shipping industry since the early 21st century leading to increased shipping expenses. Not just the things of fantasy novels, real-life pirates exist in the world today. Local fishermen, with the support of militia groups, took up arms to defend their source of livelihood. They attacked all vessels, including commercial ships, arms ships and oil tankers that passed through the Somali territory and beyond towards the Gulf of Aden, Maldives Islands and the Indian Ocean. What began as a defence against illegal sea activities became a lucrative business venture for pirates earning fortunes in return. Somali fishermen and civil war militiamen were the masterminds of the attacks. They were organized in different gangs, and their attacks involved fishing trawlers called skiffs that launched small attack speedboats to capture cargo. It also involved other commercial ships using rifles and rocket-propelled grenades. They seized vessels, took hostages and demanded millions of dollars in ransom. When cornered by international naval forces, the pirates threw their weapons overboard to discard evidence making it difficult for them to be prosecuted in international courts. Most pirates, who were arrested and charged in Kenya, were acquitted for lack of sufficient evidence. On April 18, 2009, Dutch marines freed two dozen Yemenis held hostage by Somali pirates. The pirates got away without consequence. In 2007, pirates killed a Chinese sailor when their ransom demands were not met. They are suspected to have killed four Americans in 2010, and have also been accused of torture and using hostages as a shield against naval defensive fire. Over the years, weekly pirate attacks reports skyrocketed, reaching a peak of 151 known attacks in 2011. Somali pirates receive considerable support from the Somali population mainly because of the restored fish supply and the economic boost of ransom to local communities. With each “successful operation”, pirates got more funding from terrorist organizations in Somalia, Yemen and Afghanistan. These organizations include Al-Shabab, Al-Qaeda and Wahhabi terror groups. Local investors also invested shares in different pirate gangs. The profits from pirate attacks rose from an estimated total of over $250 million USD, as of 2011, to an average of $9 billion USD annually. Profits from the infamously lucrative piracy trickled down to the pockets of local businessmen. Owners of pirate gangs became instant millionaires building luxury homes and driving flashy cars. Shipping companies spent a fortune by hiring armed guards and using longer shipping routes. Besides, pirate attacks succeeded in fending off illegal foreign fishing and improved fish harvest that was felt up to the Kenyan territory in the Indian Ocean. International efforts led by the North Atlantic Treaty Organization (NATO), United States (US), European Union (EU), Russia, and India has made significant progress in suppressing piracy incidents. NATO launched Operation Open Shield to defend the international waters against Somali pirates while America became aggressively involved after the Hijack of a US vessel and capture of its Captain, Philips. They have fielded warships and naval forces to directly engage the pirates. Somalia government has also stepped up efforts by attacking pirate bases on land. Such measures led to the drop of pirate activities such that only one attack occurred in 2012 and none for the next five years. It is believed that most pirates are now involved in weapon smuggling and terror groups and their complete elimination largely depends on Somalia becoming politically stable. In October 2016, the UN noted that Somali pirates “possess the intent and capability to resume attacks.” Though the EU and the US still conduct their own operations in the area, NATO’s withdrawal of its Operation Open Shield in December 2016 left a big gap that pirates may utilize. On the evening of March 13, 2017, the pirates broke their long absence from the vice and hijacked a Sri-Lankan oil tanker called Aries 13. The pirates are still in possession of the vessel and its crew. What Languages are Spoken in Somalia?